Let me tell you a few things I recently learned about ostriches…but first I should put things in a little bit of context. Now that I had let fear into my heart it became VERY important to me that I find an ostrich that was used to being ridden. Preferably one that REALLY enjoyed being ridden. Maybe an ostrich somewhere that loved having people on its back so much that it would seek out interaction, softly cooing and nuzzling you until you gave in and jumped on his back making him the happiest ostrich in all the land. I found the next best thing. Joe Hedrick makes his living raising exotic animals and traveling the country doing shows and setting up ostrich and camel races. I got in touch with him months ago but never managed to cross paths with him until now. I don’t know if the video shows it (I really hope it doesn’t) but I was noticeably shaking while interviewing Joe inside the ostrich pen. With the ostriches. Nothing between them and us. Maybe I’m a big sissy. Okay…I AM a big sissy. But things didn’t improve. Just before the race Joe and I walked out into the center of the arena and talked at the crowd a little bit telling them my story and whatnot. Maybe that isn’t necessarily what was said but needless to say I was nervous. I jumped on top of the giant feathered dinosaur in the starting gate and he started to buck. The ostrich leapt out of the chute and I suddenly understood what everyone was saying about trying to stay balanced on top of a 450-pound football. It’s not easy. 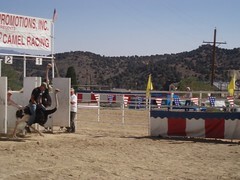 I was mostly focused on my hands as I hung on for dear life so I missed out on quite a bit of what happened but from what I hear I started in second place and briefly held first just before my ostrich decided to sit down. I only made it through about a quarter of the race before he gave up. I jumped off the back and waited for him to stand up. Meanwhile, he waited for me to go away. A few minutes passed and once it he decided I wasn’t paying attention anymore he jumped up and bolted for the fence. It was definitely exciting but less than completely satisfying…so when Joe asked if I wanted to go again I jumped at the opportunity. Knowing what I was in for made round two much less nerve-racking. 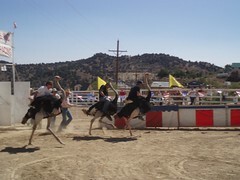 My ostrich jumped out to an early lead and left the competition behind. It was a slightly bigger bird and much easier to balance on so I was feeling pretty good. Apparently he sensed my glee and stopped in his tracks, turned a full 180 and made a mad dash towards where we had just come from. 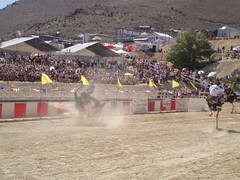 At some point he decided it was a good idea to stay at a full gallop despite the metal fence in front of us. At some point I got stepped on…I definitely have a bruise and a little bit of swelling but nothing you couldn’t earn at an average pick-up soccer game. I jumped up smiling and brushing the dust off. Gave the camera a thumbs up and brought my ostrich racing career to a close. Quick thanks to Joe Hedrick and the folks from Team Amtrekker that came out to watch. It was great meeting all of you and thanks a ton for the pictures, Teri! can you get a ticket for crashing an ostrich? can you also then not pay the ticket and have a warrant out for your arrest in Virginia City, Nevada? huh? Can YA? Great job! I’m glad I was there to see it. 🙂 Hope your leg is doing better and of course you’re welcome for the photos. @missannw: Thanks for picking up the slack for me! @georgerocks: Probably. Next time I’ll try harder! @NevadaWolf: Much better! The bruise is still visible but no pain. YAY! 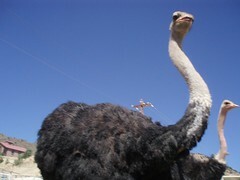 You finally got to ride an ostrich (sort of). you should show that tall mofo who’s boss. get a stepladder, climb up, and headbutt that pompous bird in the beak. chuck norris created giraffes when he uppercut a horse. FACT.